Nowadays, physical education seems to be gaining more importance than ever before. Our society overflows with conveniences, often in the form of processed foods and increasingly sedentary lifestyles. While the advent of technology has brought great innovation to our lives, it also gives some individuals even less motivation to simply get up and move. This reality even trickles down to our schools and our children, who are now experiencing a surge in obesity rates alongside its related illnesses. This is why physical education teachers are so important. Without them, many children won’t have the chance to learn how to lead a healthy lifestyle. Anyone hoping to teach physical education in the state of Oklahoma, much less the United States as a whole, has an important duty ahead of them. 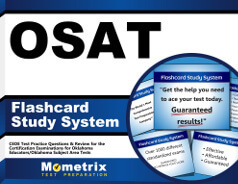 To ensure you’re up to snuff, the Oklahoma-based Office of Educational Quality and Accountability has created the OSAT Physical Education/Health/Safety exam. By taking this test, you’ll be able to prove you have all the necessary knowledge and skill to teach physical education within the state. While this final task may sound intimidating, the Mometrix Test Preparation team is here to help you with your study needs. We understand just as much as you how important this exam is to your career goals. 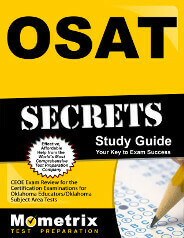 That’s why we’ve composed our OSAT Physical Education/Health/Safety (012) practice test. This resource is designed to serve as an accurate mirror of the real exam, allowing you to gain a comprehensive glimpse of what to expect from the test well before exam day arrives. Like the real test, our practice test is comprised of 81 OSAT Physical Education/Health/Safety practice questions, one essay (“constructed-response”) and 80 multiple choice (“selected-response”). The constructed-response question accounts for 15 percent of the test’s contents and focuses on Motor Skills and Movement Activities. We recommend our OSAT Physical Education/Health/Safety practice test for anyone looking to familiarize themselves with the full exam and learn their strengths and weaknesses. For the most comprehensive study experience, feel free to pair this practice test with our OSAT Physical Education/Health/Safety study guide. Good luck!